Barnaby is such a sweet friendly boy looking for a home where he will get lots of company. He is a large sized boy – maybe even a Wolfhound Cross? Weight wise he weighs 30kg. Despite his size, he is gentle and loves laying his head on your knee for a cuddle. 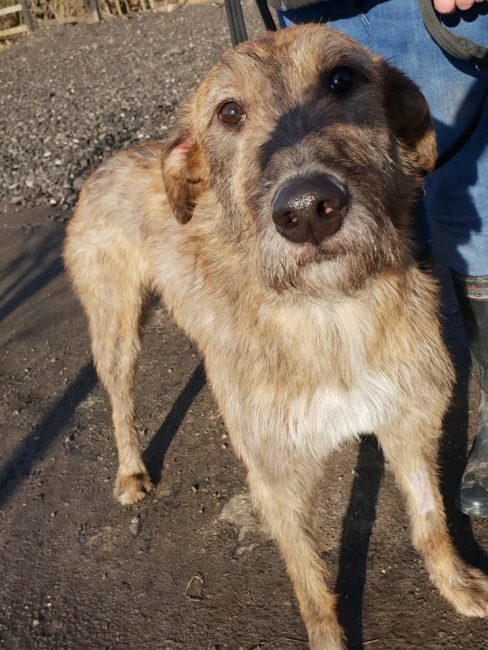 Barnaby is ideally looking for a home who have owned sighthounds before, he has a prey drive and isn’t suited to live with very small dogs or cats etc, but he is great with other larger dogs of different breeds. He may need some help with housetraining, but is generally clean in his kennel. Barnaby doesn’t like to be shut away or left alone for long and will bark, we do think with a good routine and with time for him to settle he will become a lot more comfortable being left, probably with the company of another similar breed dog. He has been fine around children and could be rehomed with children aged 8+. Barnaby will need a decent sized secure garden. He really is a true gentleman and deserves a 5* forever home.